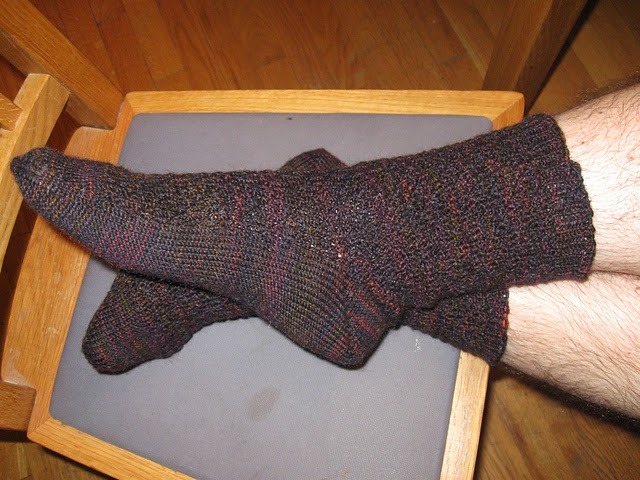 Apparently I knit not one but two pairs of Knitspot socks in the summer of 2012 (fancy that). These were a "training" project for the Ravelympics. 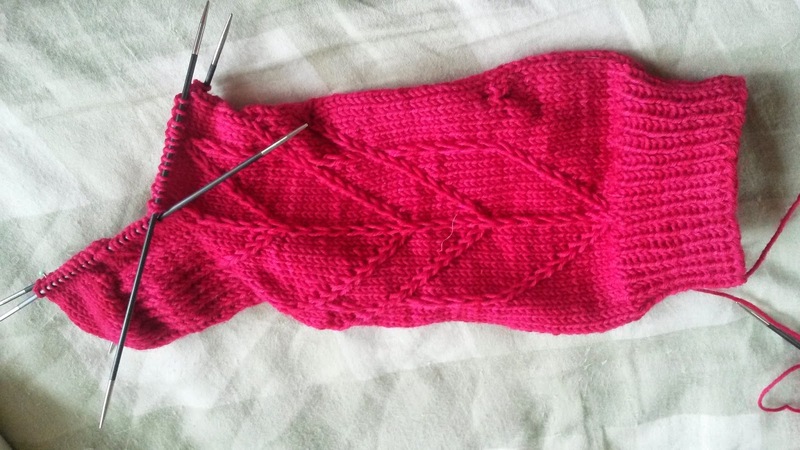 Pattern: Woodsmoke Sock by Anne Hanson. 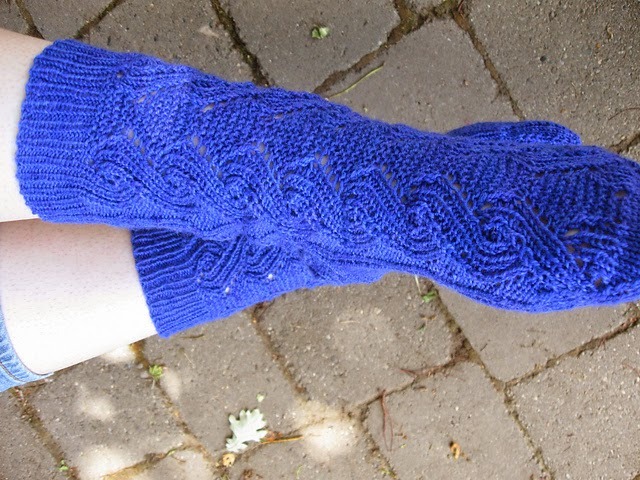 As you can tell from the name, she thought the pattern looked like curls of wood smoke in the dark brown yarn she used to knit the original, but I thought it looked like Greek keys in my Mediterranean blue yarn. Yarn: The Yarn Yard Cairn (80/20 merino/nylon, 437yds/100g skein), in an unknown colorway. This yarn was a gift from Aspen, and the pictures don't really do justice to its beauty--there were all sorts of little flashes of purple in with the blue. 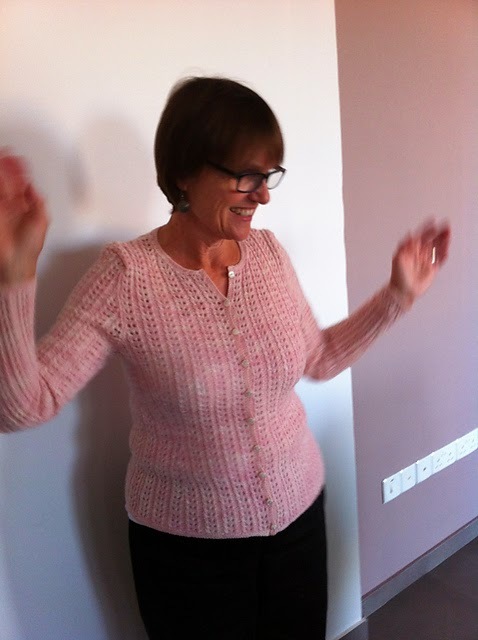 It was also really enjoyable to knit with. These ended up as a gift for my cousin Kathy (she graciously hosted us on part of our cross-country odyssey). Thanks, Kathy! Now that you're all caught up on what I've been doing that ISN'T knitting . . . here's what is. The Rose of England proceeds apace. It's past where it was before I discovered my horrible error of the other day, even. Not that you can really tell. It's still a giant white blob. But I have reached the final chart for the smaller size. 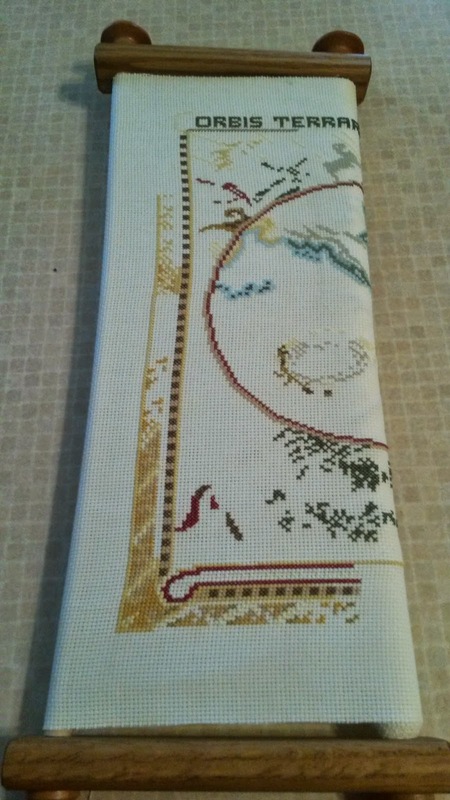 So "soon" (read: in another 30 rows) I'll have to decide whether I'll stop there or continue. 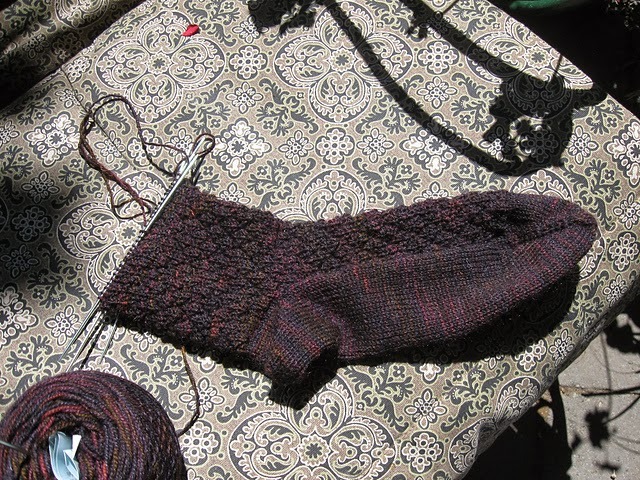 It pretty much depends on how much yarn I will have used, because the KAL requires a minimum of 1000 yards. Heaven knows I have more than enough on the cone. 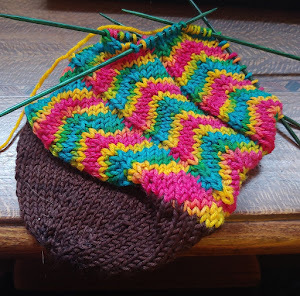 I haven't worked on them much since starting the Rose of England, but I do have non-blogged progress on my Animal Crackers socks to report--I'm past the heel turn. See? Still a nicely written pattern that's turning out a nice project. Mostly this week I've been devoted to the piece I'm designing for Heather--everything but the very last finishing is in place, conceptually, so I've been trying to push through version one so I can take version two with me on vacation next week. (More about that later.) So really I'm going to be terrifically boring for the duration. Sorry. Yeah, yeah, we're supposed to call them the "Ravellenic Games" now, but whatever. I invite the IOC to send me a cease-and-desist, as it will only drive traffic to my tiny blog. 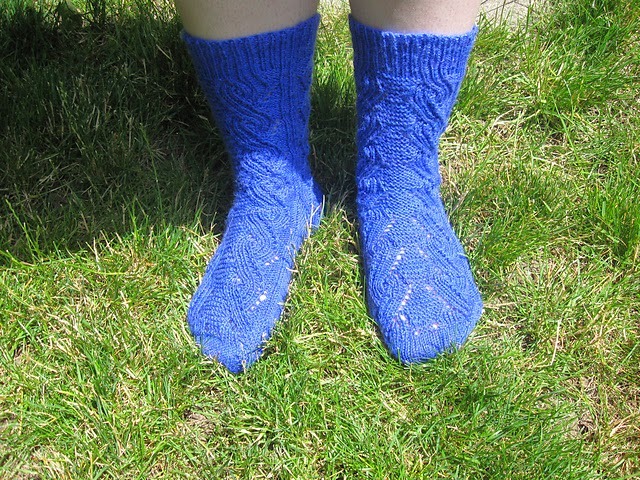 Anyhoo, I knit these socks for the 2012 Summer Games. They were chosen cannily as a project suitable for knitting quickly while traveling--we drove across the country three times that summer (I don't recommend it, incidentally). I was right to do it, they knit up easily in the allotted time and I achieved three medals, which still may be seen on my Ravelry profile. Yarn: Mountain Colors Bearfoot (60/25/15 wool/mohair/nylon, 400yd/100g skein) in colorway "Moose Creek." Love this yarn. It's nice and thick (verging toward sport) and cushy. I intended to give them to my dad for his birthday that year, but (foolishly) I put them into storage and then moved, so they became a Fathers' Day present for 2013. When he was living in Cyprus. A place where no mohair socks are ever needed. But now he's back in Idaho and wearing them regularly. So knitworthy, my dad. You may have noticed that there hasn't been much in the way of WIP updates this past week or so. Partly this is because I am a multicraftual sort, and I have been working on things other than knitting. Such as cross-stitch . . . 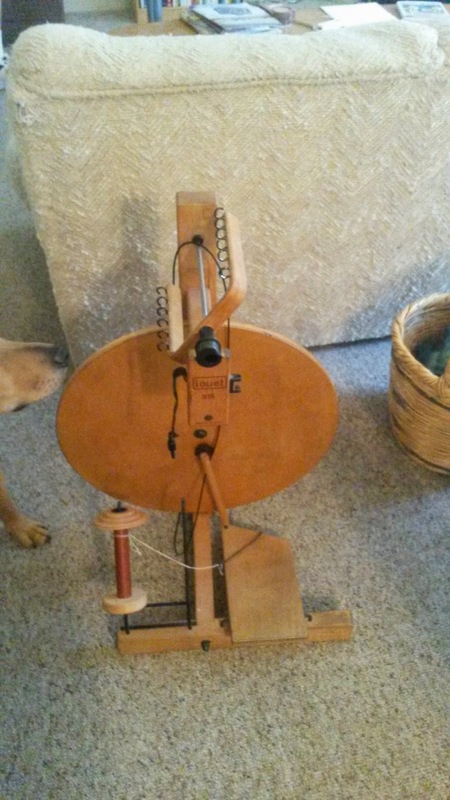 Yes, I have taken up spinning, after a too-good-to-pass-up opportunity to acquire a wheel came my way. It is a Louet S15 (discontinued, but similar to the S10), and I am utterly terrible at using it. Really. So bad. You have no idea. But practice makes perfect, as they say, so I try to spin at least every now and again. 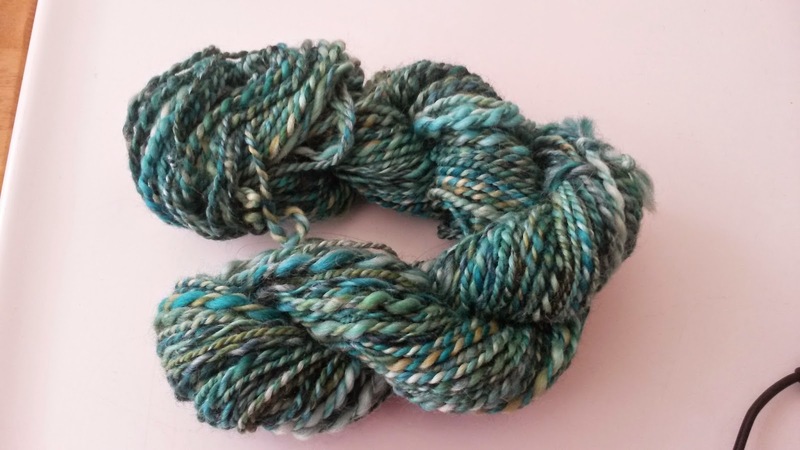 This is some combed BFL top from Pigeonroof Studios in the colorway "Marine," and it really came out nicely. I still need to wash the finished product, but eh. It turns out that, as badly as I drag my feet when it comes to finishing knitting projects, I'm even worse when it comes to spinning. 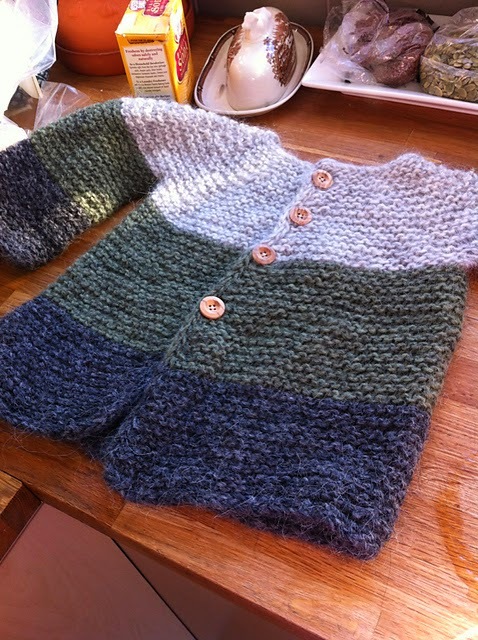 And let's not even talk about actually knitting anything with the handspun. About two years ago, there was a spate of babies in the land. I knit this little sweater with a certain recipient in mind, but after finishing it and seeing how FREAKIN' ADORABLE it was, I reconsidered. To be frank, I was not sure the intended recipient's mother would appreciate a handknit properly. So I sent it to my friend Catherine instead, because she rocks, and because I thought it would look awesome on her little boy. In, like, two years, because it came out kinda big, and said little boy is still pretty little.